How the AWD system for Taurus performs. Is it operating all the time? Or only when slip occurs. Have you had any problems with the AWD? Also looking at Fusion AWD, are the two systems the same? Thanks for responding. Even though I'm in Ontario, AWD cars are rare on the ground. Hello. Regarding the AWD system on theTaurus, I have been very pleased with it. I have a 2011 SHO that I purchased with 57,000 on it. I have put 90,000 more on it and it has given me no issues. Running good all season tires on it, I have had absolutely no issues with it here in West Michigan. The car is very sure footed in all 4 season and inspires confidence even in the worst of weather. Acording to the owner's manual it is a full time system. I have never noticed any wheel slip or a transfer of power from front to rear or vice versa. The car is always, solid, dependable and sure footed. I have heard the Fusion's AWD system is different but I do not know for sure, I have not researched it myself. 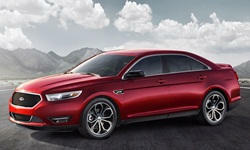 For an all wheel drive car, it I were not driving this Taurus, I would be driving an AWD Lincoln, Ford or a Subaru. My wife is on her fourth Subaru. I won't go back to a 2WD or FWD again.